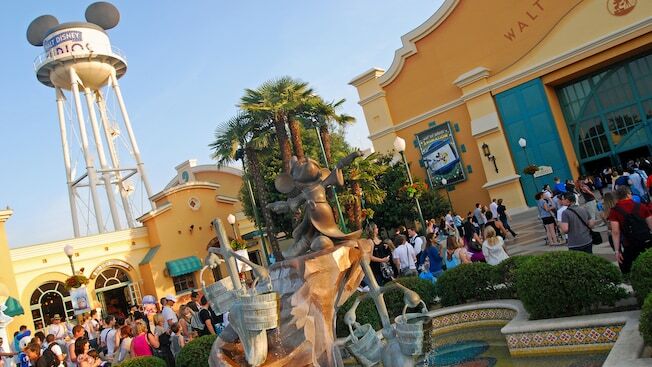 Here you’ll disciver the secrets behind the magical scenes of Disney film and television, from legendary moments in motion at Toon Studio to the mind-boggling effects of the Backlot, with five production zones bursting with thrills! Art of Disney Animation This will feed your imagination and teach you about the birth and legacy of Walt Disney animations. 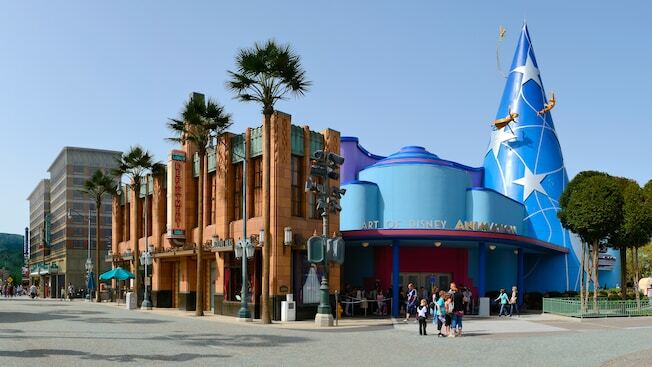 You’ll be whisked into the world of Disney animation in a cinema presentation with classic clips and animation demonstrations, where you can watch Disney Characters from all eras take shape. You can even try your hand at crafting some magic yourself to complete the interactive experience. 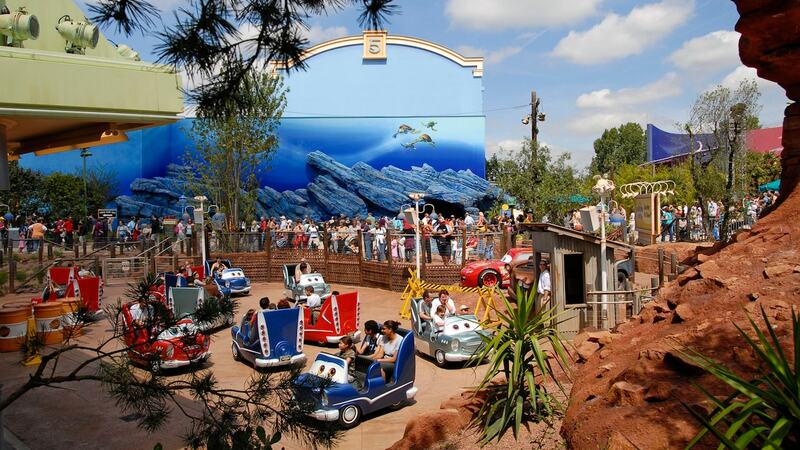 Cars Four Wheel Rally Hop into your chosen Cars Four Wheel Rally vehicle and put your foot down, as you accelerate through the desert town of Radiator Springs with your favourite four-wheeled friends. 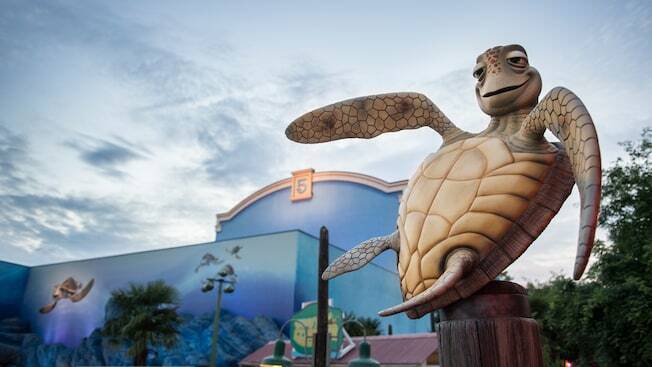 Crush’s Coaster Join Crush and friends in Toon Studio, where you’ll find the beached soundstage and set of the Disney Pixar film, Finding Nemo. Take in the Sydney Harbour scenery, board a turtle shell and prepare for a ride through memorable moments from the movie. Sit tight, as your shell dives into the ocean and begins its incredible journey plunging to the deepest darkest depths, where you’ll find voracious glowfish, jellyfish and sharks. Disney Studio One Take a tour of Tinsel Town with a difference. Become part of the production. Slide on stage and strut your stuff amid the bright lights of a Hollywood movie set. From the glitzy ’20s to the swinging ’60s, there’s a production in progress full of one memorable scene after another. And you’re smack bang in the thick of it all. Flying Carpets Over Agrabah This is based on the hit Disney film Aladdin. The story continues as the lovable Genie, in a fit of flight and fancy, has conjured up an entire fleet of magic carpets for adventure-seekers to experience. 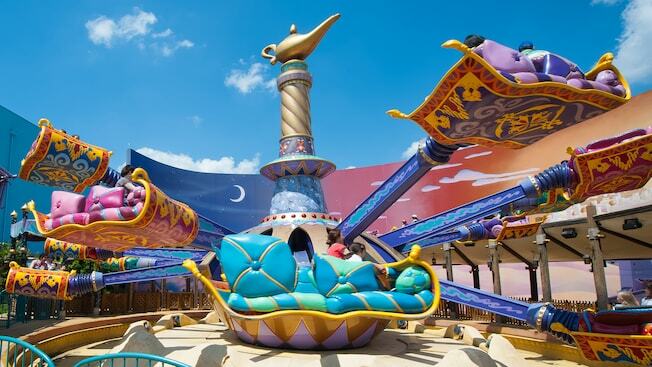 Climb aboard your very own magic carpet and take off on a ride above the bustling streets of Aladdin’s land. Swoosh up, down and around a giant genie’s lamp and grant your own wishes by using the sacred scarab to command your carpet to climb higher, dive lower and tilt backwards and forwards. 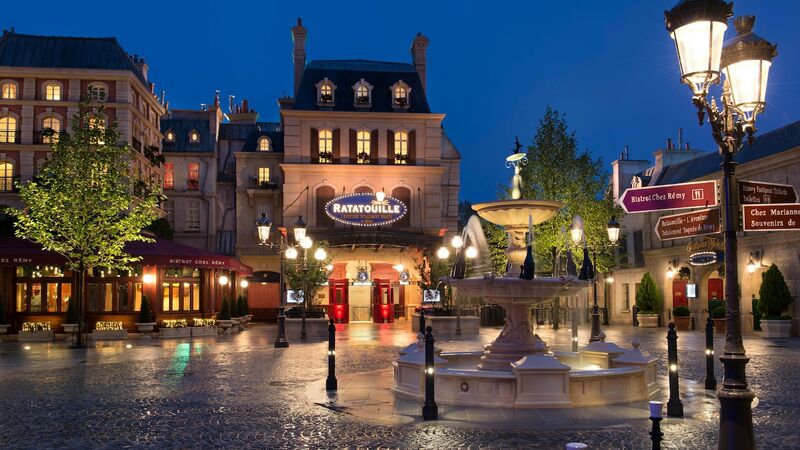 Ratatouille: The Adventure Pull your tails in and feast your senses on this brand new 4D experience. Remy and friends have cooked up a delicious storm but it’s not long before they and you are discovered by Chef Skinner, who chases you all through the sights, sounds and smells of Gusteau’s famous Parisian restaurant. RC Racer At the back of Toy Story Playland, Andy has unpacked his RC Racer and set up a half-pipe of epic proportions. The orange structure looms overhead. At Disney RC Racer, it’s as if you’ve been shrunken down to the size of Buzz and Woody. Once you’ve climbed into the huge remote controlled car, sit tight, as Buzz and Woody ramp up the speed and launch you on a thrilling ride of steep ups and downs. Over and over again. 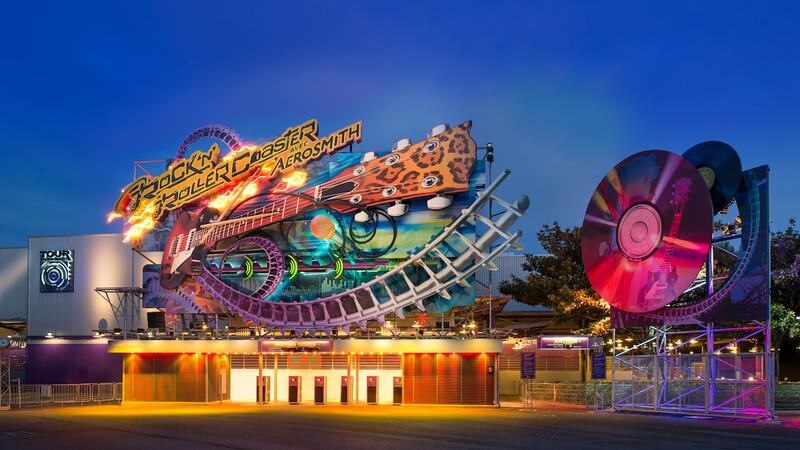 Rock n’ Roller Coaster Starring Aerosmith Waltz into Tour de Force Records and get ready to rock out in an Aerosmith music video. The Bad Boys from Boston are working with engineers on a revolutionary new sound and they want you to be centre stage. So jump into a Soundtracker with onboard speakers and turn the amp to the max. 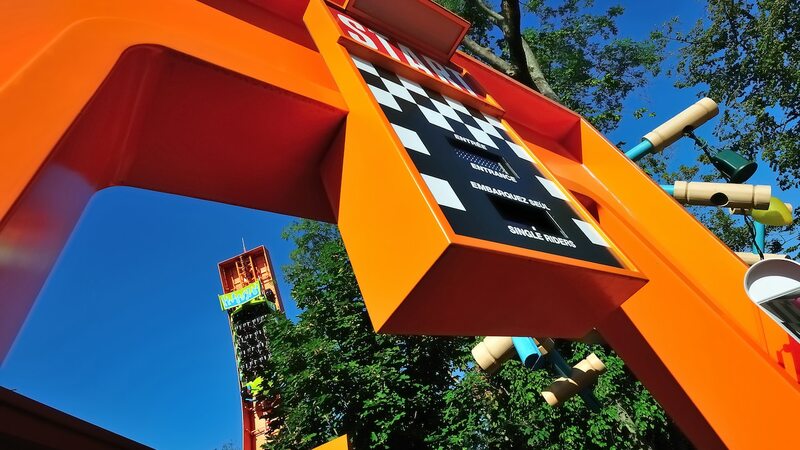 Once strapped in, you’ll feel the pulse of 62 mph rock ‘n’ roll blasting you through lightning rigs, hairpin turns, heart-stopping drops and loops. 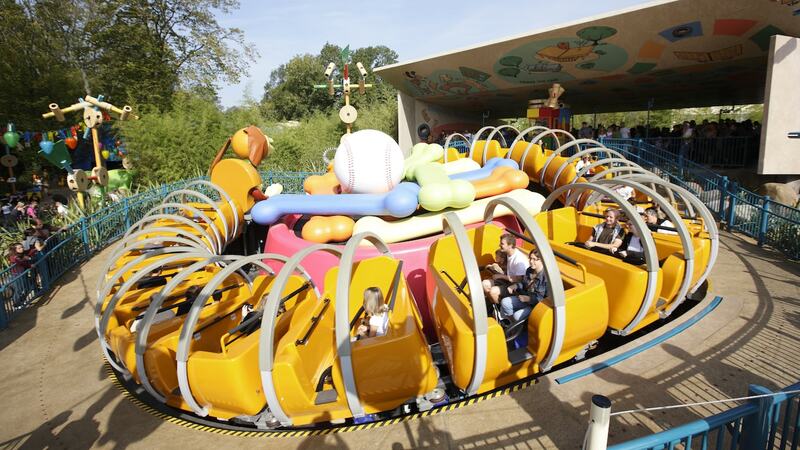 Slinky Dog Zigzag Spin Shrink down to the size of Buzz and Woody at Slinky Dog Zigzag Spin and clamber onto the back of Slinky Dog, as he embarks on some loopy laps trying to catch his tail around a dog bowl filled with rubber bones. Studio Tram Tour Board a high-tech tram at Studio Tram Tour and let the voice of Jeremy Irons guide you around the magic of Walt Disney Studios Park. 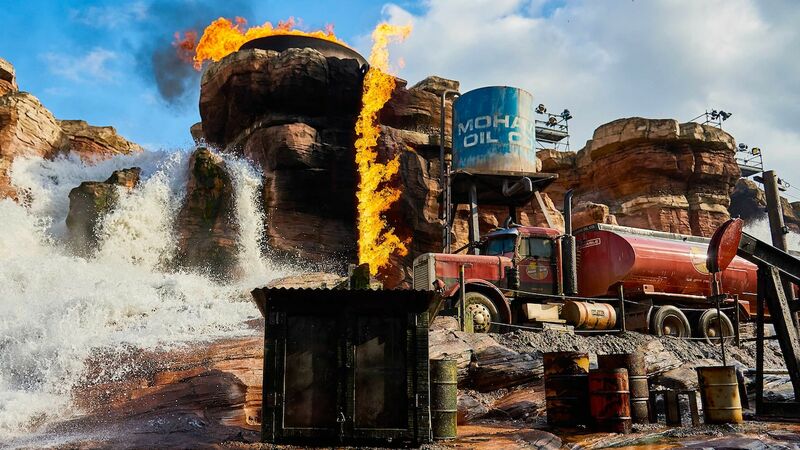 You’ll see full-scale movie sets and boneyard props, but remember to keep hold of your hat as a detour through Catastrophe Canyon spectacularly lives up to its name. Toy Soldiers Parachute Drop Sarge has enlisted you to his little green regiment, but first you need to learn to parachute. 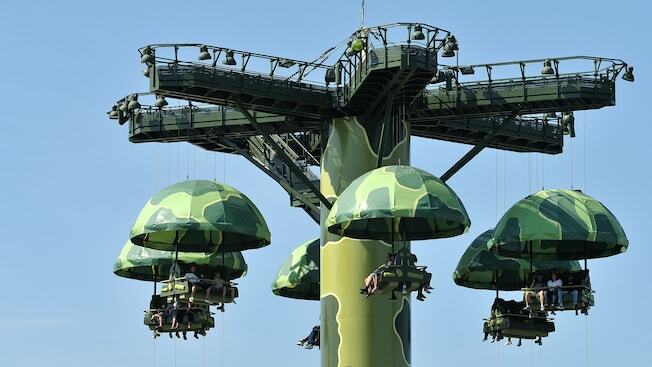 So buckle up recruit, follow your orders and brace yourself for a thrilling 82-foot drop above an army base full of lookout towers and over-sized green toy soldiers. It’s as if you’re part of one big play set! 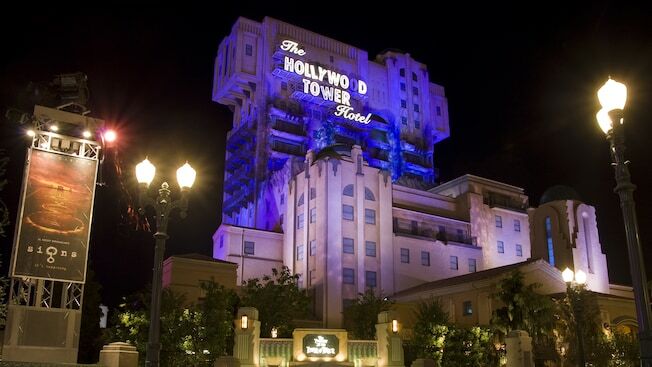 The Twilight Zone Tower of Terror Tour the infamous Hollywood Tower Hotel, the one-time haunt of Tinseltown’s rich and famous, until a mysterious incident forced it to close in 1939. Venture under the wrought iron gates of the abandoned abode and step inside a dusty lobby, seemingly frozen in time. Edge into a dark library with strange artifacts. As lightning illuminates the darkened room, a nearby television set springs to life and Rod Serling welcomes you on a journey into the Twilight Zone. From a secret passage, trudge into the shadowy confines of the dilapidated boiler room, home to rattling machinery and your vessel into the 5th dimension: the service elevator. Enter the rickety lift and strap yourself in, light bulbs spookily flickering on and off above you……..